Physical characteristics: Anna's hummingbirds have tube-shaped bodies, long foreheads, and short, straight bills. All birds have green feathers. The male has a black bill, and a red crown, top of the head, and throat. The female has a gray head. The male has gray tail feathers; there are white tips on the female's tail feathers. Birds range in length from 3.9 to 4.3 inches (10 to 11 centimeters). Males weigh from 0.12 to 0.2 ounces (3.5 to 5.8 grams). Females weigh from 0.12 to 0.17 ounces (3.3 to 4.7 grams). This hummingbird was named for the wife of a nineteenth-century bird collector, Duke Victor Massena. Geographic range: Anna's hummingbirds range in southwest Canada, the western United States, and northwest Mexico. Birds migrate during the winter, traveling south from locations such as Oregon to Arizona and Mexico. Habitat: Birds live in forests, grasslands, and in towns and neighborhoods near gardens and parks. Diet: Anna's hummingbirds drink nectar. They eat flies, wasps, bees, spiders, and insects. Hummingbirds take prey off plants or catch it while flying. Behavior and reproduction: Anna's hummingbirds are solitary, and males defend their territory. The breeding season lasts from November to May, sometimes extending to July. During that time, the female may have two or three broods, groups of young birds hatched at the same time. The male leaves after mating. The female lays two eggs in a nest located on the branch of a tree or bush. The nest is made of material including leaves, feathers, and spider webs. 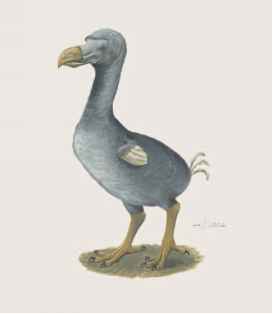 The female incubates the eggs that hatch in fourteen to nineteen days. The birds fledge in eighteen to twenty-six days. Anna's hummingbirds and people: Many people in North America put feeders containing sugar water in their yards so they can watch Anna's hummingbirds. Burton, Robert. The World of the Hummingbird. Kingston, Canada: Firefly Books, 2001. Howell, Steve N.G. Hummingbirds of North America. San Diego, CA: Academic Press, 2002. Dunn, Terry. "Hummingbirds: Frantic and Fascinating." Zoogoer 31, no. 2 (2002). 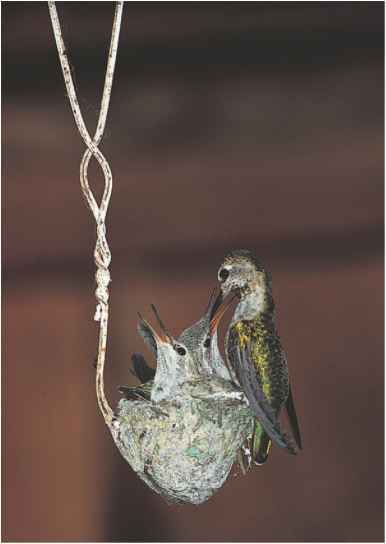 Online at http://natzoo.si.edu/Publications/Zoogoer/ 2002/1/ hummingbirds.cfm (accessed on July 19, 2004). "Hummingbird." San Diego Zoo.org Animal Bytes. http://www. sandiegozoo.org/animalbytes/t-hummingbird.html (accessed on June 24, 2004).